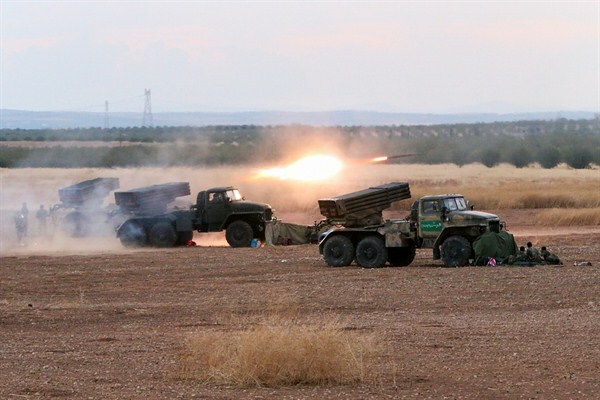 Syrian army rocket launchers fire near the village of Morek in Hama province, Oct. 7, 2015 (AP photo by Alexander Kots). Syria’s most successful rebel alliance may have just barely avoided breaking apart. Over the spring and summer of this year, the coalition of Islamist rebel groups known as Jaish al-Fateh, or the Army of Conquest, scored a series of dramatic victories over the regime of Bashar al-Assad in northwest Syria. But in the past several weeks, just as Jaish al-Fateh announced a major new offensive, one of its most hard-line factions, Jund al-Aqsa, very publicly quit the coalition. The acrimony that has followed the withdrawal of Jund al-Aqsa—an ultra-extreme splinter of al-Qaida’s Syrian affiliate, Jabhat al-Nusra—has exposed the persistent and probably unresolvable divisions among Syria’s rebels. And the announcement from rebel corners last week that Jund al-Aqsa may rejoin Jaish al-Fateh does not mean these divisions are going away.